The green light has been given for full construction to begin on the 400 MW capacity, 116 turbine Rampion Offshore Wind Farm. 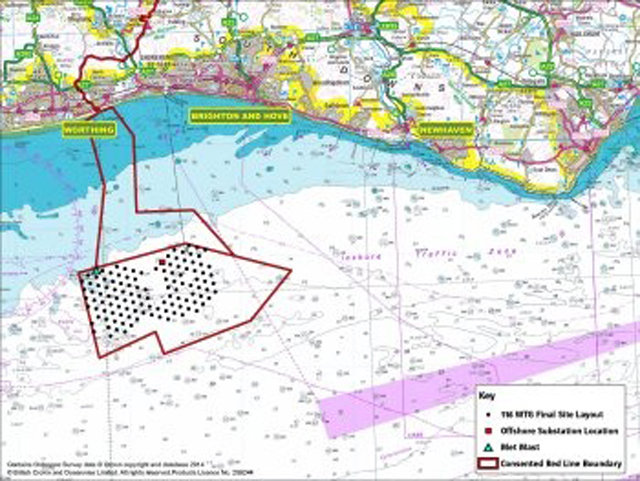 The wind farm will be situated 13km off the Sussex coast, between East Worthing and Brighton. Construction of the onshore substation in Twineham is planned to start this month, closely followed by preparation works for the onshore cable route. Offshore construction will commence in early 2016 with planned completion in 2018. E.ON UK chief executive, Tony Cocker, said: ‘This is an important milestone for what is a strategically important project for the UK. Huub den Rooijen, head of offshore wind for the Crown Estate, added: ‘The announcement of the £1.3billion investment from E.ON and the Green Investment Bank in the Rampion offshore wind farm represents a major milestone as it becomes the first project to enter construction under our Round 3 leasing programme.